In 2007 Academy Award-winners Jack Nicholson and Morgan Freeman starred in the feel-good movie The Bucket-List which followed two terminally ill men on their around the world trip trying to complete their wish list before they passed away. 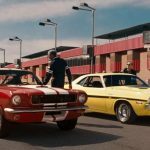 For one scene the two stars got behind the wheels of some serious American muscle, a 1965 Shelby GT350 and a 1970 Dodge Challenger to be exact. 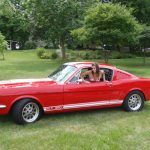 This past week saw the 1965 Shelby GT350 clone go up for auction on eBay finishing at a unexpectedly low $23,600. Below I’ve pasted the full story from the seller in case the auction page gets removed. Check it out for the full history. – A “Letter of Authenticity” on Warner Brothers Studios letterhead, signed by the Director of Transportation. – The California title showing the car was titled to Ghostlight Industries. – An original, named, and numbered movie script from the movie. – An original The Bucket List movie hat given to production crew members. – A hat from Auto Club Speedway. – An original and certified autographed photo, signed by Morgan Freeman, showing him in this car. – Other registration and auction materials showing the history of the car. 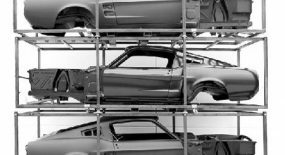 – Auto Enthusiast Magazine copies, showing the car. – 2012 Support Our Soldiers calendar showing the car with Miss September. – A digital file containing numerous before and after photos, movie clips, movie still photos, and related documents. 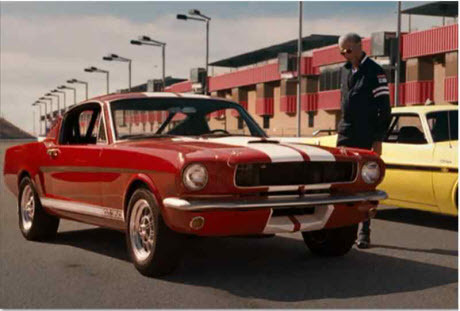 After the filming and production of The Bucket List movie in the fall of 2006, the passenger side damage from the filming was repaired, and the 2 surviving cars were stored in a warehouse by Ghostlight Industries. 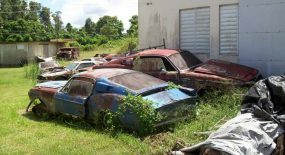 The other surviving car was sold at auction in 2009 and taken to be displayed in a private collection. This car sat until it was sold at auction, and purchased by me in June of 2010. Since then, it has been stored in a private warehouse. The car has been displayed on a few occasions at car shows and for a photo shoot for the Support Our Soldiers 2012 calendar. 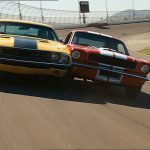 It was the subject of the 2011 Auto Enthusiast Magazine issue article on movie cars. It was also invited to be displayed as a feature vehicle at the 2012 Greater Milwaukee Auto Show, produced by MotorTrend Magazine. 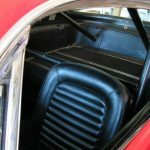 The car retains the original roll cage that was used in the movie. In order to regain the function of the folding rear seat, the lateral bar has been cut. The lateral bar can now be moved in and out of the car, to accomodate rear passengers. The undercarriage and frame have been reinforced with 2 front-to-rear round steel tubes in order to strengthen the body and frame. 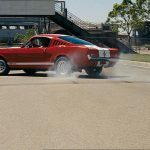 The passenger side of the car still retains the custom square tube steel hidden under the rear wheelwell, that was installed in order to withstand the sideswipe impacts from filming. The inside of the trunk still shows the tell-tale signs of the dents being pulled after filming. I decided to leave these indicators intact, in order to sustain the provenance of the car. The passenger side body work is beautiful, as can be seen in the photos. It also has the chrome Monte Carlo bar under the hood that stabilizes the shock towers. I decided to spruce up the car by adding a new glove box door, front and rear GT-350 floor mats, new front carpet, rear carpet, folding seat carpet, folding seat chrome, rubber door and window seals, and black rear seat vinyl. 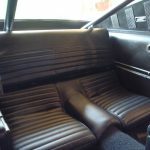 The rear seat that was folded down during the filming of the movie was actually white. The car will come with a new dashboard pad and headliner, if you choose to install them. I also added a locking gas cap mechanism in order to comply with Motor Trend’s rules regarding Auto Show vehicles. Also new are a battery, cables, and alternator to ensure reliability. 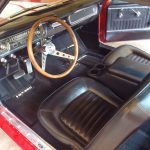 The car will also come with the “spare” manual 3-speed Ford transmission. 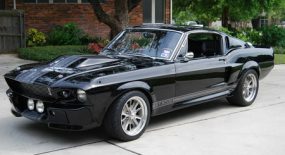 It currently has the automatic transmission installed that was used during the filming of the movie. It also had a new stock gas tank installed around 2006. The car has been maintained by a local muscle car shop by a mechanic that knows these old cars. The motor, brakes, wheels, frame and body are strong, intact, and the car drives very straight. It is a pleasure to drive and gets lots of attention with the “Bucket List Movie Car” decals on the front and rear glass. I will also include with the sale 3 framed story boards that detail the provenance of this car, complete with an original movie poster, and photos of the car in action. Also included is the custom triangular wood frame that holds the 3 framed story boards. For displaying at shows, the sale includes 8 black stantion barriers with retractable straps. 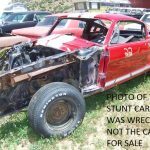 When the car was owned by a previous owner in 2006, he disassembled the car with the intent of doing a full restoration, but then ran out of funds. So, he listed it for sale online. According to my conversation with him, he received a call from a “potential buyer” who agreed to meet him to look at the car. They met at his home and struck a deal to sell the car. The buyer then paid for the car with thousands of dollars in cash that he had in a paper bag. After the deal was signed and the keys were handed over, the buyer contacted a flatbed truck that was parked around the corner. It was loaded up and hauled away to Ghostlight Industries for the movie makeover. 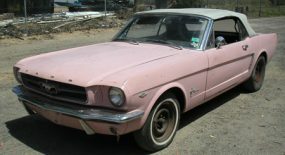 The seller was never told where the car was going, or that it was going to be transformed into The Bucket List Movie Car. 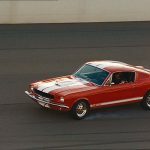 For the Shelby GT-350 purists, I know the 1965 should be Wimbleton White with Guardsman Blue stripes, and that the red/white color scheme of this car is actually a 1966 Shelby color scheme. 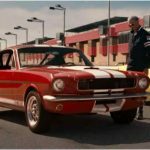 According to the owner of Ghostlight Industries, the director of the movie, Rob Reiner, did not care if the script called for a 1965 Shelby, he wanted the car exactly as you see it. 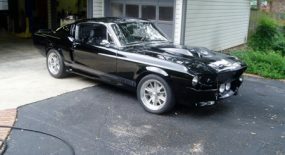 This car may not be the Bullitt mustang of movie cars, but the value of this car is sure to increase as time goes on. It does need a few improvements such as replacing the wing window handle, radio speaker and the heater box. 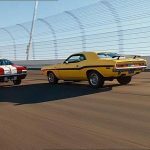 Depending on which list you check, the Bucket List race is one of the most well-known movie races of all time. I am only selling this car because it spends way too much time tucked away in it’s Car Jacket in a warehouse. I really would like to see it go to someone who will display it to the public. Be prepared for the lines of people who want to know all about your movie car!